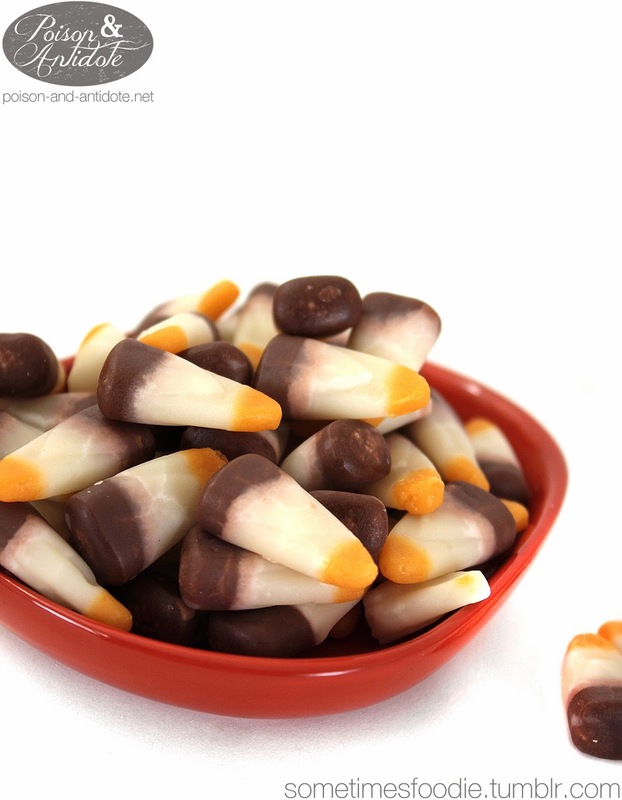 Time for a Halloween staple, candy corn! The packaging is the same as any other bag of candy corn, but what sets this item apart is the large s'more in the upper left corner and the uniquely colored candy inside. From top to bottom there is a yellow-orange cap, a chalky translucent white center and a chocolatey bottom. 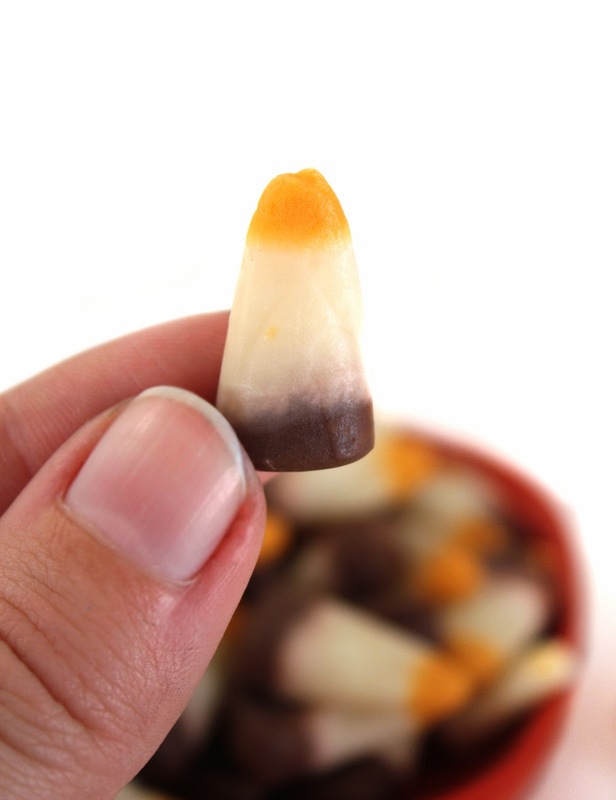 (Similar to Indian style candy corn.) I really like the combination of colors, it gives you a very nice, generic, fall feeling. 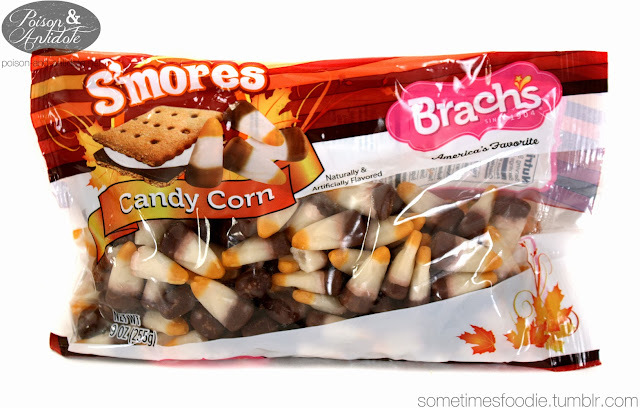 Although the bag is pretty blah, the candy would look great at a Thanksgiving dessert table. With that being said, I am one of those people who likes to bite each color section of candy corn off and each them individually. I figured I'd have to each a few of these the 'normal way' if I wanted the full s'more effect, so I did. As a whole, I can actually taste chocolate and marshmallow with just a mild hint of vanilla wafer. It was really surprising how authentic the flavors were, but the graham cracker aspect was a little weak. Although it isn't very cinnamon-y, the candy really does deliver some decent s'more flavoring. Individually, the chocolate end has a decent cocoa powder flavoring, the center has a nice vanilla marshmallow pay off and the little yellow-orange piece taste just like the marshmallow-y middle.